Necklace is in excellent condition and length is 18 inches long. See pictures for description. 1 - rice grip (press rice on grip for firm hold while writing) can use over & over again. Oh and there's plenty of extra rice for the bloopers! Makes 10 Necklaces (5- 3mm Real Leather & 5 Chain Style). 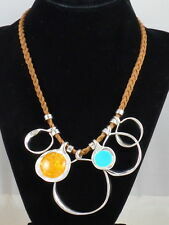 Marina DeBuchi Silver Plated Necklace "Jacqueline ". Chain is 17" Long with 3" Extender and Lobster Clasp. Note: We do not personalize or engrave. You will receive the necklace in the picture. All of our inventory is new and unused unless otherwise noted. As always, if you are local, pickup in Oberlin, Ohio is free. ~ Kim ~ His Clever Girl Resale. Preview all of our fun treasures at. SILVER PLATED. LOBSTER CLASP CLOSURE. Quantity: 1. Loop can accommodate chain or cord up to 2mm thick. This lead-free pewter charm is plated with fine Silver in an antiqued finish. Material(s) Silver Plated. Color Silver. Made Of Pure Solid 925 Sterling Silver. First letter will be Scrip captal Letter(If you do not note). Chain Length(With Plate): 35cm,40cm,42cm,45cm,48cm,50cm /14",16",17",18",19",20". free gift box . 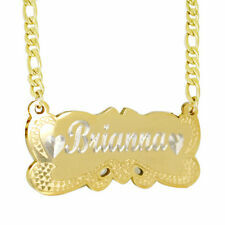 Name plate necklace that says Glamorous . Condition is Pre-owned. Shipped with USPS First Class Package. Personalized Name Plate Custom Name Necklace Nameplate Silver and Pink Stunning! The necklace it light in weight so it's super comfortable. It's unique, different and pretty. a long adjustable 24" gold beautiful chain as shown - we also have the chain in silver if you prefer. Name Plate Custom Name Necklace Personalized Nameplate Silver and Blue Stunning! This beautiful high-quality gifts are sure to make a special impression for any occasion. C. Necklace Color: Gold or Silver. Color: Gold, Silver. When you leave the leave engraving details, you can add emoji: heart, crown, cross, arrow. Gold Necklace / Gold Name Necklace / Yoga Boho Jewelry / order any name or word! This item will be hand made especially for you! Material : Solid Sterling Silver 925. GF/GP STAND FOR GOLD FILLED AND GOLD PLATED (NOT SOLID GOLD). GABRIELLE STYLE. AND A GIFT BOX. COLOR OF THE BOX MAY VARY. Pendant size (approx.). To view the showcase you need Flash 6 or higher. Material: 925 Sterling Silver. Chain Length: 17". Each product is unique and individualized. Great gifts for your love ones, friends, family and even for yourself! This necklace is available in silver or. 925 sterling silver.